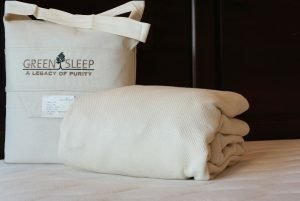 Green Sleep Accessories are made with the same purity and attention to detail found in their mattresses. Their mattress pad is made with stretchable organic cotton, and their pillow selection features an organic cotton outer cover with a variety of natural and organic fill choices. $198.00 – $238.00 Adjustable shredded rubber pillow. The Vasilo fitted mattress pad made especially for Green Sleep Mattresses. Protect your precious mattress with the same healthy organic cotton you expect from your Green Sleep mattress. This mattress pad alone took 3 years and high tech German machines to create an organic cotton weave that mimics the special malleable properties of our high end 100% natural rubber mattresses. This mattress pad is highly recommended for use with our natural rubber mattresses because it can flex with the rubber compared to non-stretchable mattress pads which reduce the flexibility. $298.00 – $438.00 Heavyweight, stretchy organic cotton protector. Perfect for use with Green Sleep mattresses or other latex mattresses. These products, although made especially for the splendid Green Sleep mattress, will add luxury to any bedroom. The Vasilo mattress pad is a fitted pad made from a stretchy knit fabric that will contour along with a natural rubber mattress so that you body can take advantage of the malleability of natural latex. 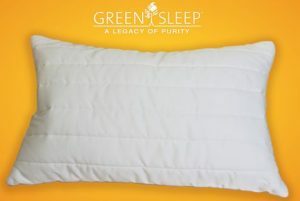 The Valini pillows are made similar to other organic pillows, with shredded rubber, natural wool, and molded rubber inside, however, they have the same luscious organic cotton velour that covers the Green Sleep mattresses.